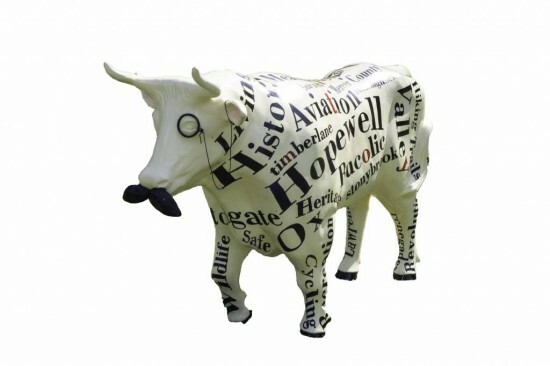 My ox project, titled Oxford, highlights Hopewell Valley’s history. The ox is almost entirely covered with a mix of words, punctuated with a hidden message (the word “community”), marked in a contrasting color. The words are all instrinsic to the Hopewell Valley region. The title “Oxford” is meant to refer to the renowned dictionary. A hashtag (#OxfordHVAC) is applied as one of the keywords to add an interactive element to the project. The lettering was applied with acrylic paint, covered with a protective clear coating.